Australia is famous for its beaches, with many beautiful swimming spots along our coastline. If you’re coming to Australia to study, work or travel, you’ll probably spend time at the beach. It’s a fun, healthy activity, and best of all it’s free! Before you hit the beach, we want to make sure you’re prepared. Because even though going to the beach may seem harmless, there are some dangers you should be aware of. A rip is a strong, narrow current of water that occurs near beaches with breaking waves, and pushes water directly away from the shore and out to sea. Rips can be dangerous, especially if you don’t know how to identify them or what to do if you get caught in one. They can lead to drowning if swimmers try to fight the current, panic and exhaust themselves. Before your first trip to the beach, make sure you learn how to spot a rip. And if you get caught in one, try and stay calm and float instead of swimming against the current, and raise your arm to attract attention from other swimmers and lifeguards. Along the coast of Australia it’s sometimes possible to spot water animals like dolphins, dugongs and humpback whales. But there are smaller creatures that can be dangerous, and it’s important you know how to spot them and what to do. The two to look out for are bluebottles and blue-ringed octopuses. Bluebottles, a type of jellyfish, are very common around Australia. They have a small blue air-filled sac that sits above the water, and a long tentacle that sits below. The tentacle is covered in stinging cells, which are very painful. Blue ringed octopuses are beautiful but deadly. Commonly found in shallow rock pools, they can be hard to spot. Their bite is usually painless, but if your lips and tongue suddenly start feeling numb, or you start having difficulty breathing, you may have been bitten, and you should seek help immediately. Like most visitors to Australia, you’re probably scared of sharks. And it’s true that when you swim, surf or dive in any ocean water there’s a risk of encountering a shark. However the chance of you being hurt or killed by a shark is extremely low. In the last 50 years there have been only 47 deaths from shark encounters in Australian waters. That’s only 0.9 per year, and some years there were none at all. If you think about the millions of people who swim, dive and surf at Australian beaches each year, your safety is almost guaranteed. 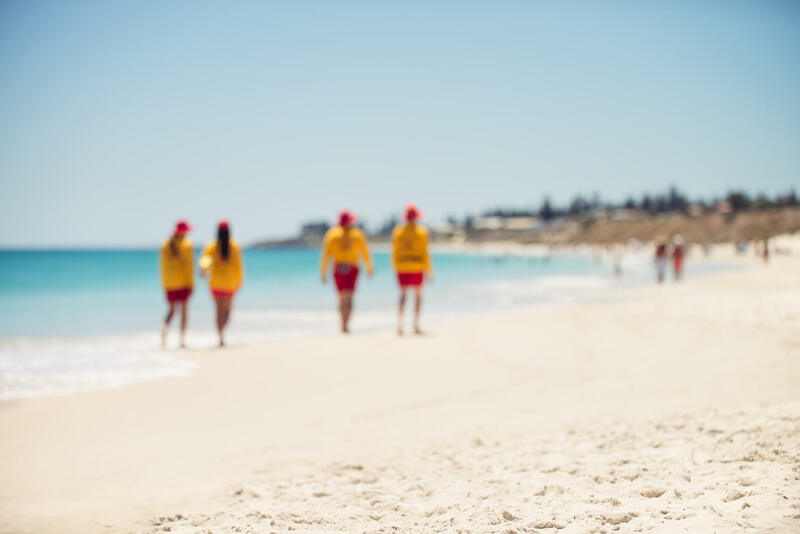 Many Australian beaches are patrolled by lifeguards, especially throughout summer. You’ll find them wearing red and yellow, usually walking back and forth between two red and yellow flags. The area between the flags is the safest place to swim, as the lifeguards will be able to see you. Of course you can’t be prepared for everything that might happen, but if you follow these basic rules, and make smart choices, you’ll have a good, safe time at the beach. Only swim at lifeguard-patrolled beaches. Read any written signs on the beach. Learn how to spot a rip. Swim, surf or fish with a friend. Never swim, surf, or fish at night. If you need help in the water, stay calm and attract attention by raising your arm above your head. Never enter the water if you’ve been drinking alcohol or are under the influence of drugs. Always wear sunscreen, even if it’s a cloudy day. And reapply every few hours. Sit in the shade and drink lots of water. If you’re not sure about something, always ask a lifeguard for help. And if you think someone’s in trouble, alert the lifeguards or call 000 for emergency services, no matter where you are. For more information, tips, to check beach conditions, or to find a patrolled beach near you, visit Beachsafe from Surf Lifesaving Australia, or download the app.